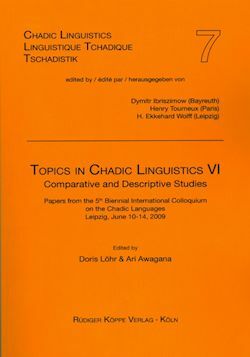 The volume contains thirteen papers from the 5th Biennial International Colloquium on the Chadic Languages, which took place at the University of Leipzig in June 10-14, 2009. Since the date of the conference and of the official retirement of Professor H. Ekkehard Wolff almost coincided, the proceedings are dedicated to this famous German Africanist, who was engaged in scientific research and teaching activities at the Universities of Hamburg, Maiduguri, Niamey and Leipzig. The colloquium was attended by international scholars from Africa, America and Europe, who presented 32 papers. The book contains a selection of contributions, which reflect current linguistic research on two branches of Chadic: West and Central Chadic. They are concentrated on Chadic internal and external classification, lexicography, semantics, and oral literature.